Aomori Prefecture (青森県 Aomori-ken) is a prefecture of Japan located in the Tōhoku region. The capital is the city of Aomori. During the Edo period the Hirosaki clan began building a seaport at the current city of Aomori. There were green woods near the city which were used as landmarks for the ships that came into port. These green woods called aoi-mori is where Aomori got its name. The prefecture came into existence in 1871. The town of Aomori was established in 1889. The town was incorporated as a city in 1898 with a population of 28,000. On May 3, 1910, a fire broke out in the Yasukata district. Fanned by strong winds, the fire quickly devastated the whole city. The conflagration claimed 26 lives and injured a further 160 residents. It destroyed 5,246 houses and burnt 19 storage sheds and 157 warehouses. At 10:30 p.m. on July 28, 1945, a squadron of American B29 bombers bombed over 90% of the city. That same day saw the end of the Seikan ferry rail service. During their 80 years of service, the familiar ferries of the Seikan line sailed between Aomori and Hakodate some 720,000 times, carrying 160 million passengers. In April 1993, Aomori Public College opened. In August 1994, Aomori City made an "Education, Culture and Friendship Exchange Pact" with Kecskemét in Hungary. One year later, a similar treaty was signed with Pyongtaek in South Korea, and cultural exchange activities began with exchanges of woodblock prints and paintings. In April 1995, Aomori Airport began offering regular international air service to Seoul, South Korea, and Khabarovsk, Russia; however, the flights to Khabarovsk were discontinued in 2004. Aomori prefecture's climate is relatively cool for the most part. It has four distinct seasons with an average temperature of 10 °C. Variations in climate exist between the eastern (Pacific Ocean side) and the western (Japan Sea side) parts of the prefecture. This is in part due to the Ōu Mountains that run north to south and divide the two regions. The western side is subject to heavy monsoons and little sunshine which results in heavy snowfall during the winter. The eastern side receives little sunlight during the summer months, June through August, with temperatures staying relatively low. The lowest recorded temperature during the winter is -9.3 °C, and the highest recorded temperature during the summer is 33.1 °C. Lake Towada, a crater lake, straddles Aomori's boundary with Akita. Oirase River flows easterly from Lake Towada. The Shirakami Mountains are located in western Aomori and contain the last of the virgin beech tree forest which is home to over 87 species of birds. Aomori Prefecture is host to the Misawa Air Base, the only combined, joint U.S. service installation in the western Pacific servicing Army, Navy, and Air Force, as well as the Japan Self-Defense Forces. On 20 February 2018 a U.S. Air Force F-16 fighter jet caught fire in flight. The pilot dumped two fuel tanks into Lake Ogawarako in northern Aomori Prefecture. Aomori Prefecture is Japan's largest producer of apples. Aomori also boasts being the home to Hakkōda cattle, a rare, region-specific breed of Japanese Shorthorn. The town of Gonohe has a long history as a breeding center for horses of exceptional quality, popular among the samurai. With the decline of the samurai, Gonohe's horses continued to be bred for their meat. The lean horse meat is coveted as a delicacy, especially when served in its raw form, known as Basashi (馬刺し). The Aomori coast along Mutsu Bay is a large source of scallops, but they are particularly a specialty of the town Hiranai where the calm water around Natsudomari Peninsula makes a good home for them. Aomori IC near the north end of the Tōhoku Expressway. The Aomori Bay Bridge which crosses over Aomori Bay. Aomori Shōwa Daibutsu (昭和大仏), also known as the Big Buddha in Aomori, is the tallest seated Buddha in Japan. Located at Seiryū-ji (Blue-Green Dragon Temple) in Aomori City, this statue was built as a symbol of gratitude for WWII soldiers as well as a symbol for Buddha's teachings. The Seiryuu-ji temple itself is relatively new and was founded in 1982 by a priest named Ryuko Oda. The temple grounds have traditional style Japanese architecture. In 1984, the Big Buddha statue was built, weighing in at 220 tons and is 21.35 metres (70.0 ft) tall. Underneath the Buddha there is a circular hallway with many paintings, pictures and small statues. A Buddha shrine with an offering table can also be found inside. Located in the town of Fukaura, the name means “twelve lakes” despite the fact that there are 33. One unique characteristic is the lakes' brilliant colors; one in particular, Aoike Lake, is a rich blue color. The Hakkōda Mountains in Aomori provide excellent hiking in the warmer seasons. However, the winter of 1902 proved disastrous to 199 of 210 soldiers who died during a military exercise in the area in deep snow. Aomori Prefecture hosted the 2003 Asian Winter Games. 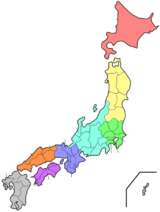 According to Ken Cannon, there are three major dialects spoken in Japan; standard Japanese, Kansai dialect and Tōhoku dialect . Tohoku dialect, or Tohoku-ben, is found in northern Japan and is spoken between farmers and country folks. This dialect is also referred to as "zuu zuu-ben" because its phonology causes the Standard Japanese syllables /(d)zɯ, (d)ʑi/, as well as, intervocally, /tsɯ, tɕi, sɯ, ɕi/ to merge into /zɯ/. There is a negative connotation that surrounds people that speak this dialect, labeling them as lazy country folks. Due to this negativity speakers of Tohoku-ben will hide their accents when speaking standard Japanese. ^ 青森県平内町. "水産業 - 青森県平内町". town.hiranai.aomori.jp. Retrieved 28 March 2018. ^ "Festivals and Fireworks : Aomori Prefecture". Northern-Tohoku. Archived from the original on May 14, 2013. ^ "Tachi Neputa Festival in Goshogawara City". Aomorimori.wordpress.com. September 15, 2009. Retrieved July 13, 2012. ^ "Fall Festivals : Aomori Prefecture". Northern-Tohoku. Archived from the original on May 14, 2013. ^ "Lake Towada Winter Festival". MisawaJapan.com. Retrieved August 6, 2009. ^ "Seiryu-ji Temple: aka: The Big Buddha in Aomori". Aomoristory.blogspot.com. August 1, 2010. Retrieved July 15, 2012. ^ "'Jesus tomb' Aomori tourist draw, The Japan Times". Retrieved 2012-06-06. ^ "All You Need to Know About Japan's Weirdest Dialect, Tohoku-ben". Tofugu. July 25, 2011. Archived from the original on November 7, 2011. ^ "Matsuzaka". nikkansports.com. Archived from the original on 2008-06-09. Retrieved 2008-05-23. Tanaka, Hideki (1996-09-10). "On the Palatalization of [dz] and [s] in the Nambu Dialect" (PDF). Tsukuba English Studies. 15: 159-186. Aomori (青森市, Aomori-shi) is the capital city of Aomori Prefecture, in the Tōhoku region of Japan. As of 1 April 2017, the city had an estimated population of 287,800 in 136,209 households, and a population density of 350 persons per km2. The city is one of Japan's 48 core cities. The total area of the city was 824.61 square kilometres (318.38 sq mi). The Aomori Expressway (青森自動車道, Aomori Jidōsha-dō) is a two-lane national expressway spur route in Aomori, Aomori Prefecture, Japan. It is owned and operated by East Nippon Expressway Company and is signed E4A as a direct extension and spur route of the Tōhoku Expressway. Aomori Station (青森駅, Aomori-eki) is a railway station in the city of Aomori, Aomori Prefecture, Japan, jointly operated by East Japan Railway Company (JR East) and the third-sector railway operator Aoimori Railway. The Daini-Michinoku Toll Road (第二みちのく有料道路 Daini Michinoku Yūryōdōro) is a two-lane toll road in Aomori Prefecture connecting the towns Rokunohe and Oirase. The Daini-Michinoku Toll Road was designated in 1987 as part of a single expressway running from the capital city of Aomori Prefecture, Aomori to the prefecture's second largest city, Hachinohe, Aomori. The road is managed by the Aomori Prefecture Road Public Corporation and is numbered E4A as an extension of the Tōhoku Expressway. Hachinohe (八戸市, Hachinohe-shi) is a city located in Aomori Prefecture, Japan. As of 28 February 2017, the city had an estimated population of 229,527, and a population density of 756 persons per km2 in 107,598 households. This makes it the second biggest city of Aomori prefecture. The total area is 305.54 square kilometres (117.97 sq mi). Ishikawa Station (石川駅, Ishikawa-eki) is a railway station located in the city of Hirosaki, Aomori Prefecture Japan, operated by East Japan Railway Company (JR East). JMSDF Hachinohe Air Base (八戸航空基地, Hachinohe Kōkūkichi) (ICAO: RJSH) is a military aerodrome of the Japan Maritime Self-Defense Force (JMSDF). It is located 3.0 NM (5.6 km; 3.5 mi) northwest of Hachinohe in Aomori Prefecture, in northern Honshū, Japan. The Kamikita Expressway (上北自動車道 Kamikita Jidōshyadō) is a free two-lane expressway in Aomori Prefecture connecting the towns Tōhoku and Rokunohe. Alongside other tolled-roads, the expressway is part of a series of highways that will link the Hachinohe Expressway to the Aomori Expressway. The road is managed by the Ministry of Land, Infrastructure and Transport and is numbered E4A as an extension of the Tōhoku Expressway. It is routed concurrently with an alternate route of Japan National Route 45. Komagome River (Japanese: 駒込川（こまごめがわ）, Hepburn: komagomegawa) is a river in Aomori Prefecture, Japan. It begins in the northern Hakkōda Mountains and flows into Aomori Bay at Aomori. It has a length of 32.3 kilometers (20.1 mi) and is designated as a Class B river. The Mabechi River (馬淵川, Mabechigawa) is a river located in eastern Aomori prefecture, in the Tōhoku region of northern Honshū in Japan. The river is 142 kilometres (88 mi) long and has a watershed of 2,050 square kilometres (790 sq mi). The Mabuchi River rises from the Sodeyama Plateau in the Kitakami Mountains of northeastern Iwate Prefecture and flows to the northeast between the Kitakami Mountains and the Ōu Mountains through eastern Aomori Prefecture into the Pacific Ocean at Hachinohe, Aomori. The river flows through scenic Basenkyō Gorge in Ninohe, Iwate, which is located within the Oritsume Basenkyō Prefectural Natural Park. The Port of Hachinohe is located at the mouth of the river. The city of Hachinohe utilises water from the Mabechi River for industrial purposes. The Michinoku Toll Road (みちのく有料道路 Michinoku Yūryōdōro) is a two-lane toll road in Aomori Prefecture connecting the cities Aomori and Hachinohe via Shichinohe. It serves as an alternative to Japan National Route 4, bypassing the towns Hiranai and Noheji by cutting directly through the Hakkōda Mountains and other mountains of the northern Ōu Mountain Range. The road is managed by the Aomori Prefecture Road Corporation and is numbered E4A as an extension of the Tōhoku Expressway. For the United States Air Force use of this facility, see Misawa Air BaseMisawa Airport (三沢飛行場, Misawa Hikōjō) (IATA: MSJ, ICAO: RJSM) is an airport in Misawa, a city in the Aomori Prefecture of Japan. It shares facilities and airport codes with the Misawa Air Base. Mount Iwaki (岩木山, Iwaki-san) is a stratovolcano located in western Aomori Prefecture, Tohoku, Japan. It is also referred to as Tsugaru-Fuji due to its shape. The mountain is listed as one of the 100 Famous Japanese Mountains in a 1964 book by mountaineer/author Kyūya Fukada. The mountain and its surroundings are located within the borders of Tsugaru Quasi-National Park. Namioka Station (浪岡駅, Namioka-eki) is a railway station on the JR East northern Ōu Main Line located in the city of Aomori, Aomori Prefecture Japan. The Oirase River (奥入瀬川, Oirase-gawa) is a river located in eastern Aomori prefecture, in the Tōhoku region of northern Japan. The Oirase River is the only river draining Lake Towada, a large caldera lake on the border of Aomori and Akita Prefectures. The river flows in a generally eastern direction, through the municipalities of Towada, Rokunohe, Oirase and Hachinohe before exiting into the Pacific Ocean. The upper reaches of the river form a scenic gorge with numerous rapids and waterfalls, and is one of the major tourist attractions of the Towada-Hachimantai National Park. The lower reaches of the river are used extensively for irrigation. In 1996 the sound of flowing water at the Oirase River was selected by the Ministry of the Environment as one of the 100 Soundscapes of Japan. Tsugaru-Yunosawa Station (津軽湯の沢駅, Tsugaru-Yunosawa eki) is a railway station on the northern Ōu Main Line in the city of Hirakawa, Aomori Prefecture, Japan, operated by East Japan Railway Company (JR East). The Tsugaru Strait (津軽海峡, Tsugaru Kaikyō) is a strait between Honshu and Hokkaido in northern Japan connecting the Sea of Japan with the Pacific Ocean. It was named after the western part of Aomori Prefecture. The Seikan Tunnel passes under it at its narrowest point 12.1 miles (19.5 km) between Tappi Misaki on the Tsugaru Peninsula in Aomori Prefecture, Honshu, and Shirakami Misaki on the Matsumae Peninsula in Hokkaido. Japan's territorial waters extend to three nautical miles (5.6 km) into the strait instead of the usual twelve, reportedly to allow nuclear-armed United States Navy warships and submarines to transit the strait without violating Japan's prohibition against nuclear weapons in its territory. The part of the Seikan Tunnel that passes under the strait is considered to be under Japanese sovereignty. The part of the Tsugaru Strait considered to be in international waters is still within Japan's exclusive economic zone.The Tsugaru Strait has eastern and western necks, both approximately 20 km across with maximum depths of 200 m and 140 m respectively.In the past, the most common way for passengers and freight to cross the strait was by the Seikan ferry, approximately a four-hour journey. On September 26, 1954, 1,172 lives were lost when the ferry Tōya Maru sank in the strait.Thomas Blakiston, an English explorer and naturalist, noticed that animals in Hokkaido were related to northern Asian species, whereas those on Honshu to the south were related to those from southern Asia. The Tsugaru Strait was therefore established as a major zoogeographical boundary, and became known as Blakiston's Line or the "Blakiston Line".